Glenn Bady (pictured right) is another one of Philadelphia's finest. Bady paired with the late Wilbert Paige at West Philadelphia High School to produce a formidable duo. Both met in the lunchroom where other players talked trash and played fierce grudge matches. The two would pair to match rival Bartram High which fielded Norman "Pete" Rogers and Raymond "Dragon" Robinson. 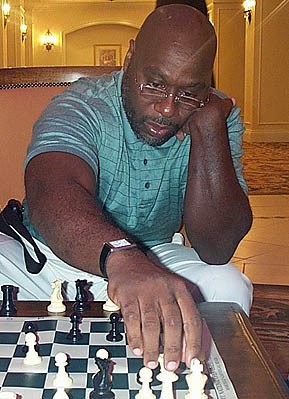 All four (and later Elvin Wilson) would become National Masters and the bedrocks of the Black chess community in Philly. 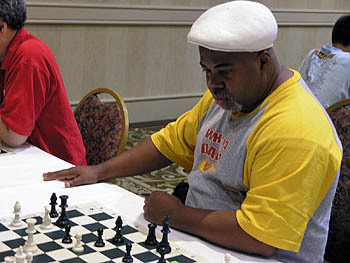 Bady had a successful 6½-2½ result at the 2006 U.S. Open and was paired against a strong National Master from Michigan, Bill Calton in the 7th round. The opening was the Benko Gambit and fireworks occurred shortly after the opening as Bady swung from queenside to kingside with his assault. White's forces were caught "flatfooted" as black's attack was swift and direct. Nice performance by the Philly veteran. "NM Bill Calton vs. Glenn Bady"